(Becket, MA) — Jacob’s Pillow announces that internationally sought-after Colombian-Belgian choreographer Annabelle Lopez Ochoa is the recipient of the 2019 Jacob’s Pillow Dance Award. With a career that spans over 15 years, Lopez Ochoa has created over 90 works for more than 50 major dance companies around the world—bridging different countries, genres, and reputations with a fluency that is unmatched. Lopez Ochoa will accept the award as part of Jacob’s Pillow Season Opening Gala on June 15. Ochoa joins a list of honorees that include Annie-B Parson and Paul Lazar, Bill T. Jones, Merce Cunningham, Kyle Abraham, Michelle Dorrance, Camille A. Brown, Liz Lerman, and Faye Driscoll, among others. “Annabelle Lopez Ochoa is a versatile and prolific choreographer who has created signature works for companies around the world. A global citizen, she creates rigorous works of great beauty and intensity in hybrid contemporary and classical ballet vocabularies that enable dancers to truly realize themselves. Ochoa demands that dancers are deeply and unabashedly present, and because of this, the audience cannot help but be drawn to them. We honor her many achievements while investing in the work she has yet to create,” says Jacob’s Pillow Director Pamela Tatge. “I am deeply moved that my artistic statelessness is being recognized as a strength. What I once considered my greatest challenge turns out to be the reason I was chosen for this year’s Jacob’s Pillow Dance Award. This award encourages me to continue speaking not with one voice, but with many,” says Jacob’s Pillow Dance Award Winner Annabelle Lopez Ochoa. 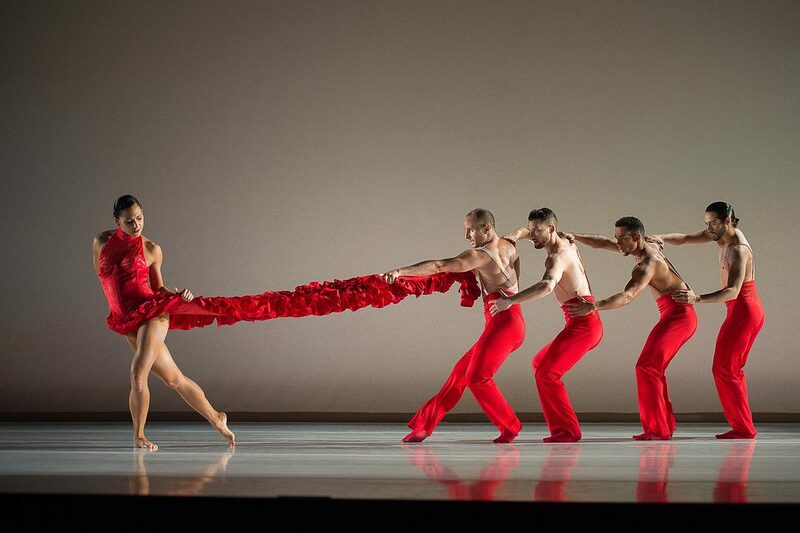 Lopez Ochoa’s choreographic career began in 2003, after 12 years of performing with several European dance companies. Since then, she has been praised as a “rising star of the Dutch dance scene” (NRC newspaper) and was later lauded a “truly masterful choreographer with an edge for dance” (Temecula Performing Arts Examiner). Her work can be found in the repertoire of some of today’s most celebrated dance companies including New York City Ballet, Dutch National Ballet, Pacific Northwest Ballet, The Washington Ballet, and English National Ballet, as well as in theater, opera, musical theater, and fashion. Additional accolades include a South Bank Sky Arts Award and a National Dance Award for Best Classical Choreography, in addition to frequent highlights in the “Best Dance” lists of The Guardian, Dance Magazine, and Dance European Magazine, among others. Lopez Ochoa is often interviewed on the scarcity of female choreographers in the classical ballet world; her fame and long list of commissions serve as an example for future generations. In her own words, Lopez Ochoa explains, “Dance for me is the language that is closest to me. I speak five languages (French, Dutch, English, Spanish, German) and I find myself in situations that none of these languages perfectly expresses my state of mind. With dance, I always seem to get to the point” (Soluciones Magazine). Director Pamela Tatge will present Annabelle Lopez Ochoa with the Jacob’s Pillow Dance Award as part of the Season Opening Gala on June 15. For the occasion, Oliver Greene-Cramer and Grace Morton of Ballet Austin will perform Lopez Ochoa’s Symbiotic Twin, a duet originally created for The Ashley Boulder Project, revived in 2019 for Ballet Austin. Dance Theatre of Harlem will premiere an expanded version of Lopez Ochoa’s Balamouk, originally commissioned by City Center for Fall for Dance, July 10-14 in the Ted Shawn Theatre. In addition, Annabelle Lopez Ochoa will direct the Contemporary Ballet Program at The School at Jacob’s Pillow in 2020 alongside Luis Torres. Explore a multimedia essay on Annabelle Lopez Ochoa on Jacob’s Pillow Dance Interactive. Ballet Hispánico performing Lopez Ochoa’s Línea Recta in 2017. Artists of American Ballet Theatre performing Lopez Ochoa’s Island of Memories in 2015. Les Ballets Jazz de Montréal performing Lopez Ochoa’s Locked up Laura in 2010. The Jacob’s Pillow Dance Award was created in 2007 by an anonymous donor whose commitment to an ongoing annual gift to Jacob’s Pillow of $50,000 is generous and far-reaching. The Award, presented each year to an artist of exceptional vision and achievement, carries a cash prize of $25,000 which the artist can use in any way they wish. The remaining $25,000 supports the Pillow’s commitment to the research and development of new work in the recently launched Pillow Lab. Residencies at the Pillow Lab offer free housing, unlimited use of studio space, and access to the Pillow’s rare and extensive Archives and resources, in the beautiful retreat-like atmosphere in Western Massachusetts all year long. In commemoration, the honoree also receives a custom-designed glass award sculpture by Berkshire-based artist Tom Patti, whose work is in the collections of the Metropolitan Museum and other arts institutions around the world. In her 15 year career as a choreographer Lopez Ochoa has carved a position of an award-winning and sought-after choreographer who has created more than 90 works for more than 50 companies around the world including Scapino Ballet Rotterdam, Dutch National Ballet, Djazzex, Ballet de Genève, Royal Ballet of Flanders, Gothenburg Ballet, Pennsylvania Ballet, BalletX, BJM-Danse Montreal, Luna Negra Dance Theater, Ballet National de Marseille, Saarbrucken Ballet, Jacoby & Pronk, Chemnitzer Ballet, Ballet Hispánico, Morphoses Wheeldon Company, Whim W’Him, IncolBallet de Colombia, Finnish National Ballet, Compañía Nacional de Danza Madrid, Pacific Northwest Ballet, Scottish Ballet, The Washington Ballet, Ballet Nacional Dominicano, Ballet Saarbrucken, Augsburg Ballet, Ballet Austin, Atlanta Ballet, Grand Rapids Ballet, Ballet Moscow, Ballet Nacional de Cuba, West Australian Ballet, Danza Contemporanea de Cuba, Ballet Nacional Chileno, Ballet Staatstheater am Gartnerplatz Munchen, Ballet Manila, Daniil Simkin Intensio Project, 59°North Stockholm, Cincinnati Ballet, Silicon Valley Ballet, Joffrey Ballet, English National Ballet, Ballet Black, Tulsa Ballet, Smuin Ballet, Estonian National Ballet, Les Grands Ballets Canadiens, San Francisco Ballet, New York City Ballet, the Ashley Bouder Project, Kansas City Ballet, Taller Coreografico UNAM Mexico, and Dance Theatre of Harlem. Lopez Ochoa also creates for theater, opera, musical theater, and in 2006, for the celebrated Dutch fashion designers Viktor & Rolf’s project in the Van Gogh Museum. Annabelle Lopez Ochoa’s work has been presented on the Pillow’s stages numerous times, performed by Ballet Hispánico, Les Ballets Jazz de Montréal, Jacoby & Pronk and Dancers, Pacific Northwest Ballet, and American Ballet Theatre principal Daniil Simkin’s INTENSIO, a special Jacob’s Pillow co-commission. Most recently, Jacob’s Pillow commissioned Lopez Ochoa to create Línea Recta for Ballet Hispánico which was performed at Jacob’s Pillow Dance Festival 2017. Lopez Ochoa was on faculty at The School at Jacob’s Pillow’s Contemporary program in 2016 and returned to choreograph a world premiere on dancers of The School’s Ballet program in 2018, titled Scarlet Circles.